International football has become increasingly murky in recent years. In the good old days, it was simple: you played for the country you were born in, end of story. * But these days, citizenship and country of origin only tell half the story about why a guy plays for the national team he does. Today we see Argentines playing for Italy (Pablo Osvaldo), Germans playing for Ghana (Kevin-Prince Boateng), a guy from the Central African Republic playing for France (Mapou Yanga-Mbiwa), and Brazilians playing for just about everyone. Thanks to international eligibility now being tied to your family history — as far back as both sets of grandparents — and residency, it allows someone like the talented Manchester United starlet Adnan Januzaj to choose from up to seven national teams: Albania (paternal and maternal grandparents), Belgium (where he grew up), Croatia (paternal grandparents), England (where he lives now), Turkey (maternal grandparents), Serbia (parents) and Kosovo (provided they ever get official FIFA sanctioning). Predictably, this murkiness stirs a lot of emotions among supporters and the federations alike. Particularly in places like Europe, where race and ethnic origin is a prickly topic, fans seem to get up in arms anytime it’s even suggested that a foreign player be naturalized and brought in to the set up. But it’s the trend these days, and everyone is doing it… even us here in the United States. Though naturalized players have been capped by the US Men’s National Team many times in our past — think David Regis or Preki in the late 90’s — the number of recruited players has spiked since the arrival of German manager Jurgen Klinsmann back in 2011. With American seed having been spread from the numerous US military bases in Germany over the last fifty years, Klinsmann recognized the potential for a deep pool of players currently playing on the Old Continent that have US eligibility. And in his short time at the helm, Klinsmann has given caps to at least seven different players from his former country. But it’s the latest German-American recruit, Bayern Munich youngster Julian Green, that is stirring up the most mud at the moment. The son of a former US serviceman and a German mother born in Tampa, Florida, Green is one of Bayern’s most heralded young prospects. And though he just made his professional debut back in November in a Champions League match against CSKA Moscow — yes, a debut in the Champions League — he has been tearing things up for Bayern’s reserves in the German third division with 15 goals in 22 appearances. And when you consider that he’s accumulated all those kind of notches on his belt before his 19th birthday, you can understand why there’s been so much interest in getting him signed up. But much of the furor surrounding his commitment to the US revolves around those very same attributes. a single youth national team appearance for the US hasn’t been enough to calm some of green’s critics. Julian has made just a solitary appearance for any US team to this point, which was for the U-18’s back in September — though he did score in the 4-2 friendly win over Holland — so he’s not exactly well versed in the ways of the USSF and our national teams. He’s also the latest in the line of German imports that Klinsmann has brought along, which has reportedly caused issues with the team in the past. Popular opinion seems to hold that, should he make a sudden inclusion in the squad for Brazil, it might anger guys who have been “fighting in the trenches” throughout qualification and the last four years of this World Cup cycle. Furthermore, many think he’s still far too (pardon the pun) green to be bringing into the full national team set up at such a critical stage ahead of the World Cup. Sure he’s made an appearance for the arguably the best club side in the world. But he’s spending most of his time playing in the German third division, which many would argue isn’t that much better than playing in MLS. Is he really ready to make the jump? And with rumors swirling that Green was offered a World Cup roster spot in exchange for committing to switch to the US — a rumor that Klinsmann and the USSF have steadfastly denied — many are concerned that we would be wasting a valuable roster spot on a player that will likely have little-to-no impact in Brazil. The weird part of all this? All these points hold water, both for and against Green’s inclusion. But personally, I think most of the concerns are overblown. First, we’ll never know if Green is ready to make the jump unless we give him the opportunity. Yeah, it might be better for Klinsmann to use the upcoming friendlies as a chance to finalize his starting eleven. This includes looking at forwards/wide men, like Graham Zusi or Ale Bedoya. But it’s also a chance for the manager to see who is and isn’t ready to fill out the rest of his twenty-three man squad, and that includes plenty of players… including Julian Green. Obviously Klinsmann and his staff saw something they liked in Green when he trained with the US team in Europe last month. And now that he’s eligible to actually play in a match for us, why not give him the chance to prove himself in the pressure cooker that is US v Mexico. As for the argument that guys who have been in the trenches fighting for the Red, White and Blue deserve the spots more the Julian, let me ask a question in retort. Imagine that some young MLS-based American prospect shot to the fore in the early months of this season, scoring a buckets of goals before the final roster had to be named. Would you be annoyed if he was included on the World Cup roster? I’d wager not. In fact, I’d bet that most would be publicly clamoring for his inclusion. It seems like Julian is falling victim to a bias against German players, despite his talent. And lastly, I wouldn’t sweat the idea of “wasting” a World Cup roster spot on Green. each of the last four World Cups the US has participated in has seen two players on each squad not log a single minute during the tournament. So if Green goes and doesn’t see time in a single game in Brazil, it’s not like he’ll be starting a trend. And even if that is the case, Green could still benefit greatly from the experience: it could help him better learn our national team’s culture, as well as acclimate him to the pressures and environment he might find if he makes future World Cup squads. Look, all of this could very well be a moot point if Green doesn’t make the roster for Brazil 2014. And there still stands a very good chance that he’ll never pan out to meet the lofty expectations that everyone is already placing on his young shoulders. But there are many, many well-respected minds in the world of football that think Julian Green has the potential to be an outstanding player. We don’t want to look back in ten years and consider him the next Giuseppe Rossi, another world class player that slipped through American fingers into the hands of another national team. 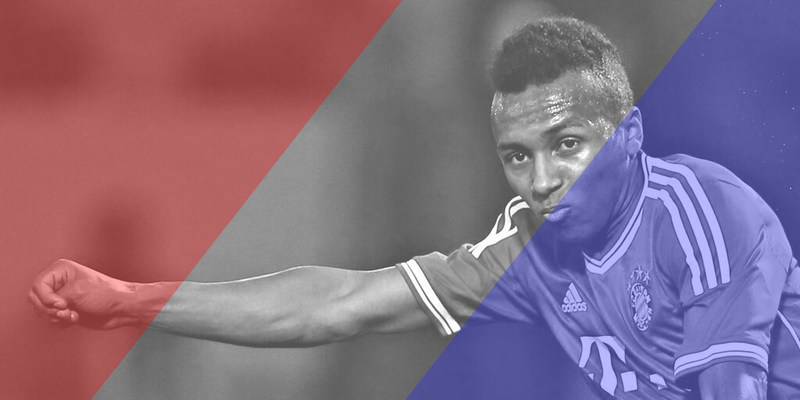 So if he makes an appearance tonight against Mexico, remember that there are two sides to the Julian Green coin. He might meet expectations, or he might not. But this is just an opportunity given. And we owe it not just to him, but also to ourselves, to at least give him a fair crack. * – YEs, I’m fully aware that international football has a quite murky past as well — especially the further back you go. Take for instance the legendary Alfredo di Stéfano. The Argentina-born forward suited up for Spain, Argentina and Colombia. He’s hardly the only one in international game’s past to have done so, but things did get relatively cleaner post-1960’s. SO WHILE THIS TREND CERTAINLY AIN’T NEW… it Is becoming more and more prevalent. All those countries were a lie. Januzaj’s grandparents are all Albanian. None of them are Croatian nor Turkish. His family is from Kosova, which was a part of Yugoslavia, that’s why the Croatians and Serbs wanted him, as they also were part of Yugoslavia once. The Turks wanted him, because his family had fled to Turkey and had lived there for five years before going to Belgium. England wanted him to wait for the call-up, as he could not yet get the English citizenship which would have enabled him to play for the English NT. He was born and raised in Belgium, which kind of explains why Belgium wanted him. And Albania and Kosova wanted him, because of his Albanian ancestry. Both his parents are Albanians from Kosova. So the only real options for Januzaj were really Albania and Belgium, and understandably he chose to represent Belgium at the World Cup.